Posted April 27, 2006 in 2006/04, 5 Studio, Art of Romance, First Romance, Hillman, Periods, Prize, Serial Posts, Topic, z Archive. I have seen some different proposals as to what was the first romance comic. It seems to me that these proposals were based on a superficial basis. If the comic title sounds good or the cover art look romantic, then it was a romance. A sort of judging the book by its cover. But a cover or title might make a teenage girl comic reader look at the issue, but it was the content that would determine if the sale would be made. To be called a romance comic, the contents must be romance. The romance genre is very recognizable, but it is the story that determines if a comic belongs to that genre not the title or cover. 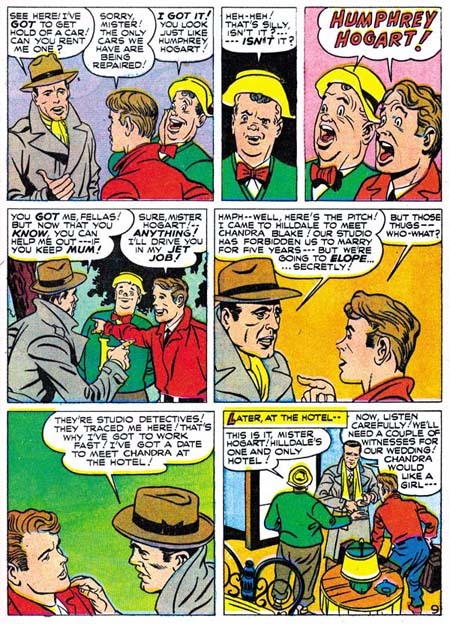 One of the contenders for the first comic romance is Simon & Kirby’s Young Romance. The first issue is dated September 1947. 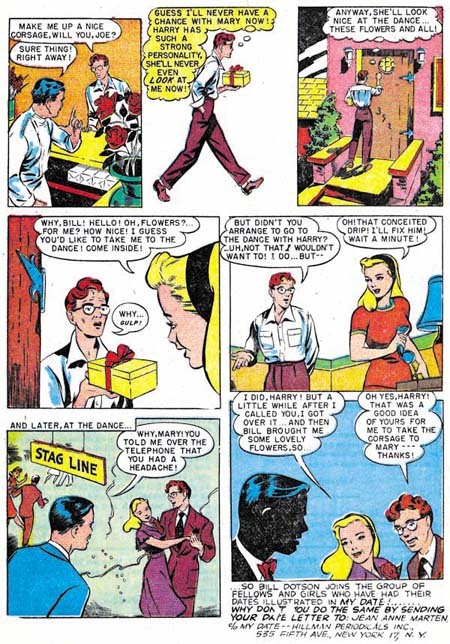 The stories in it are from the start typical for romance comics. I could describe any story from the first issue and it would easily be recognized as a romance story. But because one of the other contenders is a long story, I wanted to select a longer story to provide a better comparison. 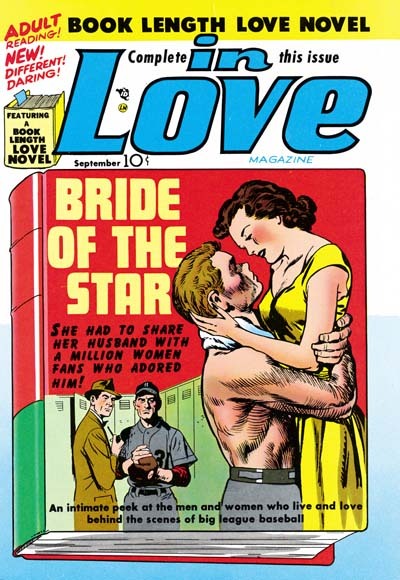 I have chosen “Bride Of The Star” from In Love #1 published by Mainline Simon & Kirby’s company (September 1954). Every so often Simon and Kirby seemed to have an interest in working in a longer comic format. This story is 20 pages long and was penciled by Jack Kirby. A young lady nearly gets beaned with a baseball. This becomes the first meeting between the new rookie Warren and Patty, who just happens to be the daughter of the teams owner. Romance and then marriage follows. But having the father-in-law as the teams owner brings in difficulty. Warren insists in not getting special treatment. Betty stays home as the team travels and follows her husband’s progress, or lack thereof using newspapers. Warren is not doing well as a pitcher, wants to be sent back to the minors and resents that his special relationship with the owner is the only reason he hasn’t been. Eventually Warren leaves both baseball and Patty. Sometime latter Warren returns to pick up his things. During a discussion with Patty, Warren wants to know if she still loves him. Patty says she wants to love him and it is not important that he is not a big star. But Warren has changed, before he wouldn’t accept defeat, now he was a quitter. Warren stays, the owner/father has a medical breakdown, and Warren helps Patty run the team. The team’s pitching staff all have injuries so Warren decides to step in and pitch. He declares he has kept himself in training. His pitching wins the game. Warren tells Patty that winning the game was not that important, it was winning her respect that mattered. Obviously their love has returned as the story ends with a kiss. 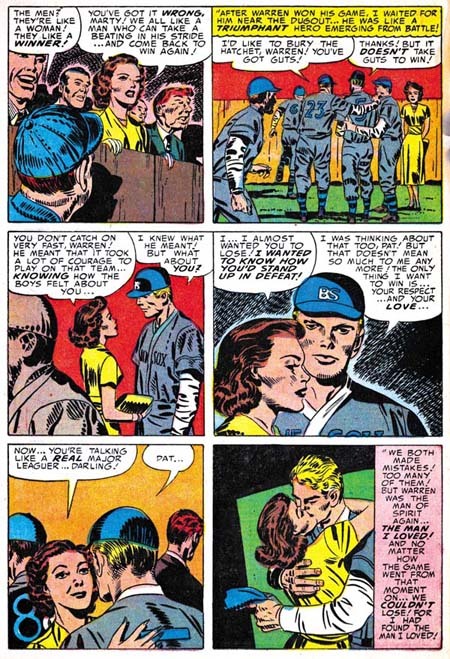 Kirby always seemed to have to add action to his love stories and this one is not an exception. Even so this story is a true romance. The whole story is told from Patty’s viewpoint. When Warren is on the road, we stay home with Patty. The only scenes of playing baseball are when Patty is there to cheer Warren on. In fact that cheering is every as bit important to the story as Warren’s pitching. The theme throughout the story is the ups and downs of the romance, everything else take supporting roles. There can be no doubt that this belongs in the romance genre. A number of people have proposed that My Date Comics was the first romance comic. 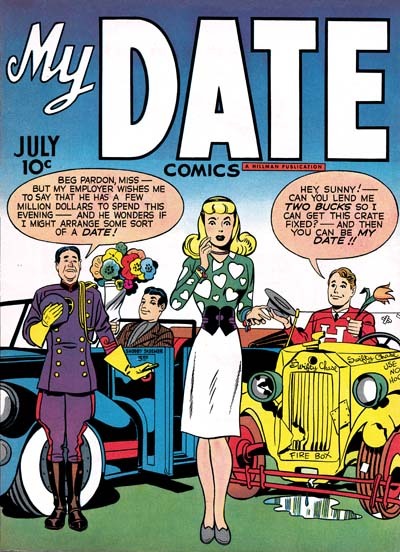 The cover date for the first issue is July 1947, two months before Young Romance #1. But let us take a look at one of the stories from My Date #1, “My Date With Swifty Chase” by our intrepid artists Simon and Kirby. It starts with Swifty pining over Sunny Daye, while Sunny is swooning over a photo of Humphrey Hogart, while Hollywood mogul B. O. confronts Humphrey insisting that he cannot marry the actress Chandra. We next find Swifty trying out his new jet propelled car, which ends in crash. Swifty is all right, but with his vehicle is in shambles and he has lost a means to impress Sunny. Later at the garage that he works, he is told to deliver a car to Sunny’s father. But instead of great opportunity he finds Sunny is only interested in the actor Humphrey. Back at the garage, a customer shows Swifty his disabled car, only Swifty realizes that the customer is Humphrey who turns out is on his way to marry Chandra. Humphrey needs a couple of witnesses, so Swifty goes to get Sunny. Sunny’s father overhears talk of elopement and calls the police. After the wedding Swifty then decides to take Humphrey and his new bride back to talk to Hollywood Mogul B. O. A rival for the affections of Sunny chases after them but in the end Swifty seems at last to have won over Sunny. There can be little doubt that this is not a romance story, but instead is S&K’s take on Archie. That is it is essentially a teen humor comic. Some of the supporters of My Date as the first romance accept this, but point to one feature, “My Date”, that is an illustrated story about an unusual date that someone supposedly sent in. So let us take a look at the “My Date” feature from My Date #4. I don’t know who the artist is, but he did a great job. It opens in a soda shop where charismatic Harry and fumbling Bill have taken notice of the beautiful Mary. Harry gets Bill to introduce him to Mary. While Bill goes to order some sodas, Harry asks Mary to the dance. Mary says she was hoping Bill would ask her. Harry tells Mary she doesn’t have to decide now and then rushes off with her on a bus, leaving Bill behind. Bill catches up, and is about to ask Mary to go to the dance, when Harry pulls him aside and tells him that Mary has agreed to go to the dance with him (Harry). Harry suggests that Bill buy a corsage for Mary to take to the dance. Bill agrees and returns to Mary’s house with the corsage. Mary interprets the gesture as an indication that Bill wants to take Mary. Bill says he would not want to get between her and Harry. Mary gets upset with Harry’s tactics and cancels the date with him. We end with Harry finding Bill and Mary at the dance together. Once again this is more like teen humor then a romance story. The My Date feature in the other issues are similar. My Date Comics may have a title that suggests to some that it is a romance comic, but the contents show that this series is not part of the romance genre. What is put forward as an even earlier contender for the first romance comic is Romantic Picture Novelettes. The title sounds like a romance and the cover art looks like a romance. The inside front cover has a photo of the “Romantic John Hodiak” and the inside back cover one of the “Romantic Alan Ladd”. The comic itself packages a story from the syndication strip called Mary Worth. Mary Worth started in 1938 and is still published today, making it the longest running continuity strip. The best description for what this strip is about it that it is a comic page soap opera. Mary Worth is an elderly, rather dowdy, lady. Although the strip carries her name, it is really about the lives of people who Mary knows. What this syndicate feature is not, however, is a romance. But with the range of story subjects in the newspaper Mary Worth strips, could Romantic Picture Novelettes be a selection of a romance story? Well the contents can be described as a picture novelette since it is 46 pages long. But is it a romance? The veiled Senora Lisa De Leon arrives at the office of the talented Dr. Karen Ward. Lisa wants Dr. Ward to perform some mysterious treatment. Dr. Ward is reluctant but agrees when Lisa proposes to endow a charity hospital. Dr. Ward gets Mary Worth to give Lisa a room during the treatment. But Lisa makes Mary promise to reveal to no one anything about herself or her treatment. When Lisa arrives at Mary Worth’s place, others try to pry into Lisa’s affairs, but to no avail. We readers however finally get a chance to see Lisa’s face. But there is nothing noticeably remarkable about it so we are still left to wonder why she hides it under a veil all the time. Dr. Worth begins the treatment at Lisa’s room. Lisa’s face becomes bandaged, but we still are not told about the true nature of the treatment. Meanwhile a Micheal Jonesy has returned from the war with a leg injury. There is a chance meeting between Michael and the veiled Lisa in the park. Friendship follows, which blossoms into something more. Michael asks Lisa to lift her veil, but Lisa is uncertain and tells Michael to return the next day for her answer. Dr. Ward visits Lisa and the bandages finally come off. When we finally get to see her face, it turns out that she now appears much younger. The treatment was some sort of plastic surgery! Lisa meets Michael in the park, now unveiled, a romance develops, sealed so to speak, with a kiss. But Michael becomes concerned that because of his injured leg, what Lisa feels is actually pity. He agrees to go to Dr. Ward for treatment and if that is successful he will then marry Lisa. Dr. Ward and Mary Worth become concern about the age difference between Michael and Lisa. Apparently the treatment will only last about 5 years, then Lisa will appear even older. Lisa insists that both Mary and the Dr. keep her secret. Michael’s treatment is successful and they set the date to be married. Now enters a new person, an elderly gentlemen named Sabin whose marriage to Lisa was stopped many years ago by her father, but who still loves her. Business takes him to the same town as the rest of the cast. He accidentally sees Lisa, recognizes her but becomes upset because it obviously can’t be her since she is too young. During a meeting between Lisa and Sabin her secret is now revealed. Michael has overheard it all, but still wants to marry Lisa. Lisa now realizes her mistake, declines and goes off with Sabin. So is this romance? There is a kiss in the middle of the book and the romance between Michael and Lisa is an important part of the story. But that is just it, the romance is part of, but not the central theme of the story. A lot of pages are spent in the mysterious treatment, which is only revealed half way through. More pages are spent on Mary Worth and Dr. Ward’s concerns about the age difference and their promise to keep Lisa secret. Part of the story is about the attempt of noisy neighbors to intrude on the secret. And although Lisa goes off with Sabin, there is no declaration of love from her for Sabin, nor a kiss between the two. In short, this is a soap opera no different from typical story lines from the Mary Worth newspaper syndication. It is not part of the romance genre. There are two requirements for a comic to be considered the earliest romance. Above I dealt with one of the requirements, that the contents of the comic be stories of the romance genre. But I would also like to add a comment on the second criteria, that the comic have an early date of publication. 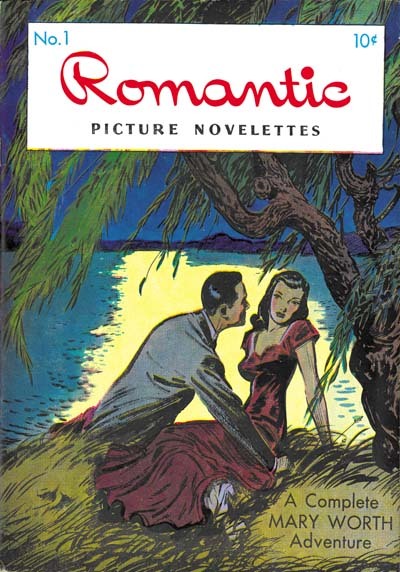 A close examination of Romantic Picture Novelettes has failed to reveal any publication or copyright dates, in fact I could not find a copyright at all. The indice only lists the publisher, Magazine Enterprises and an address. ME was created by Vincent Sullivan and was in business from 1943 to 1958. I am sure that the dates for when the story first appeared in the newspaper syndication could be determine. But that would only provide a minimal date, there is no reason to believe that the comic was published at the same time as the newspaper story finished. Frankly I find it rather surprising that so many have sited the 1946 date for this comic without explaining where it came from. But let me make it clear, that the date of Romantic Picture Novelettes is of secondary importance. It is not the earliest romance comic because it is not a romance comic at all. I hope the conclusion I draw is very clear. The romance comic is a very distinct genre. This was true over the many years that this particular comic form survived. When I look at My Date Comics or Romantic Picture Novelettes what I find does not match the romance genre. One is teen humor the other a pictorial soap opera. When I look at stories in Young Romance #1 I find a perfect match. 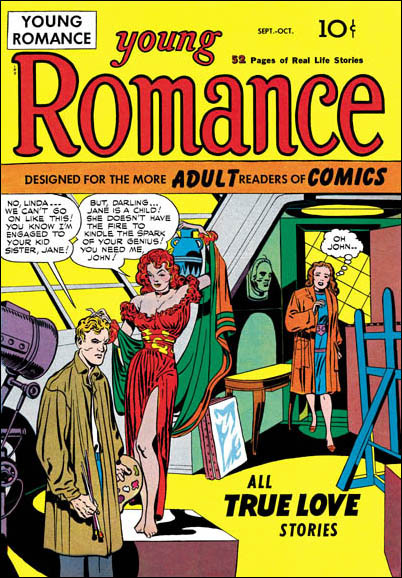 A romance comic reader from the final days of romance comics, would find Young Romance #1 a bit old fashion. But they would have no trouble recognizing it for what it was, that is the first romance comic. Could My Date or Romantic Picture Novelettes be considered prototypes? Even here I have to say no, not really. The best prototype for Young Romance #1 is just what Joe Simon said they got their inspiration, romance pulp magazines. Romance pulps were very popular at that time and provided just the proper guidance for what romance readers would want. 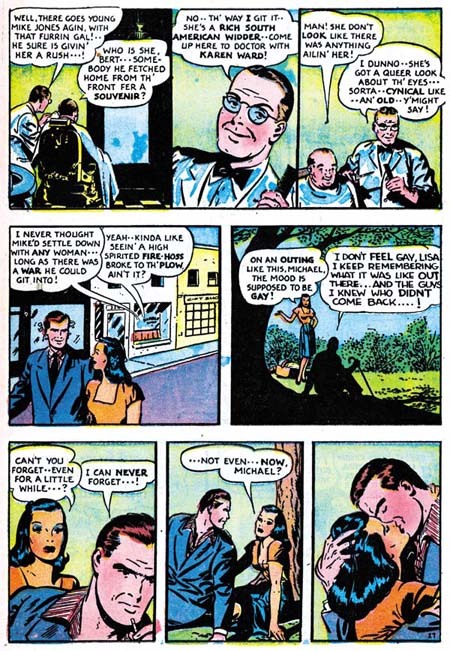 Why the continuing insistence that Young Romance is not the first comic? I have no good explanation. It doesn’t seem based on the opinions of scholars of romance comics. Nor is it based on an examination of the contents of the comics in question. Even the publication date for Romantic Picture Novelettes of 1946 is used without explanation.